In 1972 Shoe GOO was invented for "tennis toe" caused by dragging your shoe toe during "new" useable shoes again. The formula remains the same after all these years...not only do tennis players continue to use Shoe GOO, it has become very popular with skateboards and anyone not wanting to let go of those lucky shoes. 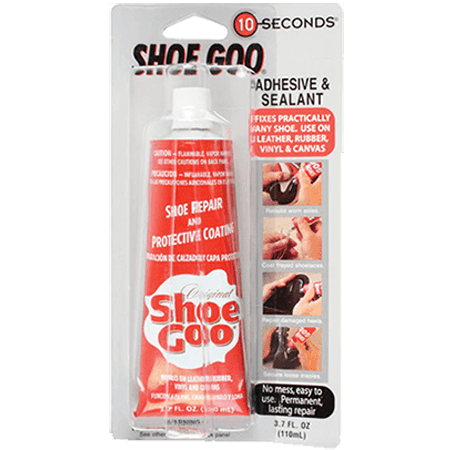 Waterproofing: Shoe GOO is water resistant immediately upon application. Apply Shoe GOO directly to the surface to be sealed. Use thin coats of Shoe GOO to build a thick coating on the surface to be sealed, allowing each layer to set 3 to 4 hours. This is especially ideal for smooth surfaces, such as plastic, glass or ceramic. Shoe GOO hardens by solvent evaporation, so allow time for thorough hardening to ensure proper bonding and wear resistance. Repairing worn soles: If a worn shoe has a hole that goes all the way through the sole, tape over the hole inside the shoe before applying Shoe GOO to the outer sole. This will help avoid creating a bump. The tape should be removed from the inside and all bumps smoothed out within 2 hours, before the glue is completely hard.